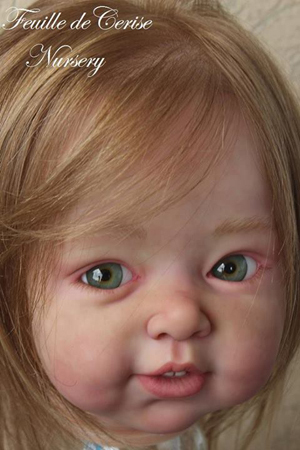 Suzanne, 5th reborn doll kit in our Toddler Sweetness Collection, our range of larger kits. This gorgeous toddler will measure 30” (76cm). She’s made of German made soft vinyl (same as Paris, Bo-Elle), easy to root and has FULL arms and FULL legs. Her limbs are sculpted just for her and will not be used on future toddlers, so she and all future toddlers in our Toddler Sweetness Collection range will be completely unique. These parts are unpainted and ready to reborn. Adrie recommends 24 mm eyes to really bring her to life.